If you have not heard of ShopBack, you have been missing out lots of cashback opportunities! If you know about it, good for you but do you know about "cashback" opportunities from Capitastar and Frasers Rewards? What is ShopBack? It is a website/mobile application which direct traffic to the relevant online shops such as Lazada, Expedia, etc. The merchants reward them with a commission for referring you to shop on their site and instead of keeping the rewards all to themselves, they share it with you! Once you have accumulated at least $10 in the account, you will be able to redeem it and transfer the cashback to your bank account! ShopBack has partnered with Amex once again to offer you cashback and Capitaland voucher! The previous promotion/tie-up was back in December 2016. You will be eligible as long as you are not holding either the Amex CapitaCard or the Krisflyer credit card. I have a total of $89.67 worth of cashback in my account and has successfully withdraw $25.60 from ShopBack. This is not a scam unlike those SIA anniversary free tickets your parents/aunts/uncles have been sharing on FB or mandarin speaking police that might have called you. Let's get started! If you have an account, skip to Step 2. Step 1: Sign up and create an account (KPO will be grateful for treating him lunch if you use his referral link) You will be awarded $5 cash in your account! I will be getting $5 too once you successfully make your first cashback redemption. Once your card is approved, your $50 Cashback will be redeemable within 60 days. You've clicked through this page to American Express and completed your application within 1 window session. For every card application, you've clicked through via ShopBack on the specific card deal on this page to American Express and applied for the same card within 1 window session. This means that every card application requires a new clickthrough via ShopBack on this page. You've applied for a card via ShopBack before 31 May 2017, 23:59. You've submitted the form within 5 days of applying the card. Your card is approved by 16 July 2017. You've successfully completed all steps 1-3 on shopback.sg/amex-promo page. Valid only on card applications via ShopBack from 26 May, 0:00 - 31 May, 23:59. Valid only on American Express CapitaCard and American Express KrisFlyer Card. $50 Cashback will be fulfilled by ShopBack. A ShopBack Member can apply for multiple cards. $50 Cashback will be given for each successful card application. Cashback will be tracked in your ShopBack account within 5 days after submitting form and redeemable within 60 days. For enquiries on the 12 destinations travel contest, please visit here. ShopBack reserves the right to pause, terminate the promotion without prior notice. Step 3: You can either apply for the CapitaCard or the Krisflyer credit card by clicking "Apply Now" (from the ShopBack site). KPO's recommendation is that you apply for CapitaCard. The Krisflyer credit card is one of the worst miles card and you cannot do much with the 5k miles. On the other hand, the CapitaCard gives you $20 once you make any purchase (>$1) with the card within the first 6 months. You can get an additional $30 + $20 if you spend $888 on the first 6 months instead (spend on Capitaland shopping malls, Fraser not eligible). However, the T&Cs did state that you can apply for multiple cards and get $50 cashback for each successful card. $100 for two credit card applications, why not? Step 4 (Important! ): Fill in the Amex credit card application form. Once you reach the "Thank You" page, take note of your application reference number. KPO will recommend taking a screenshot as well. After that, proceed to this Google Form page to submit your reference number and ShopBack email within 5 days! Enjoy the "free" cashback + voucher! KPO used the Capitaland vouchers to treat CZM to some good food in one of the Capitaland shopping mall. Chiong Housing Loan or Take It Slow? I was chatting with a friend and congratulating him on getting his BTO a while back. I got a 4 room HDB for 430k while he got a 5 room HDB for 590k (both of ours are on the mature estate and what a huge difference!). One of our conversations was on how he plans to take up a 10 years HDB housing loan and repaid it ASAP. I was telling him that he should start investing and let the money compound instead but he was more comfortable paying everything off. He said that the interest saved is quite substantial which is definitely true. I told myself I would do some forecast/calculation and here it is. By the end of 2019, he would have an estimated amount of $46,371.26 in his OA. From my understanding, during the key collection period, the HDB personnel will wipe out both you and your wife OA account leaving you with the final loan amount (not sure if you will have a choice). After deducting both their OA, their final loan amount would be $382,257.49. 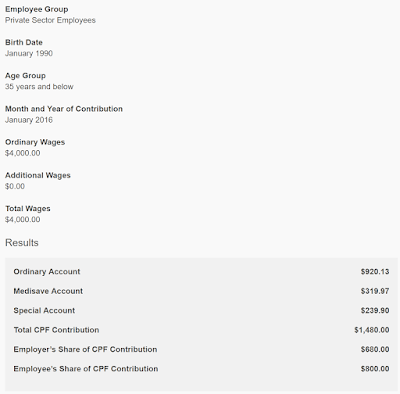 Using the CPF Interest Calculator, the monthly repayment is $3,620.95 and total interest incurred over 10 years is $52,256.08. Assuming they split the repayment equally, the monthly repayment will be $1810.48 each ($920.13 from CPF OA and $890.35 cash). After repaying everything, a simple projection of another 15 years shows that he would end up with $241,158.00 savings, $201,176.74 in OA and $219,016.19 in SA, a total asset of $661k! The couple would be a millionaire with a fully repaid house. The monthly repayment is $1,734.19 and total interest incurred over 25 years is $137,998. Holy! That is a 164% more interest one would have to pay! 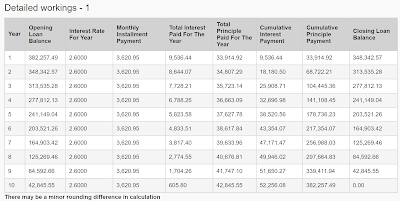 Assuming they split the repayment equally, the monthly repayment will be $867.10 each which can be paid in full using CPF OA. At the end of 25 years, he would have $348,000.00 in savings, $24,786.13 in OA and $219,016.19 in SA. That is a total asset of $591k with more cash in hand too (still a millionaire). 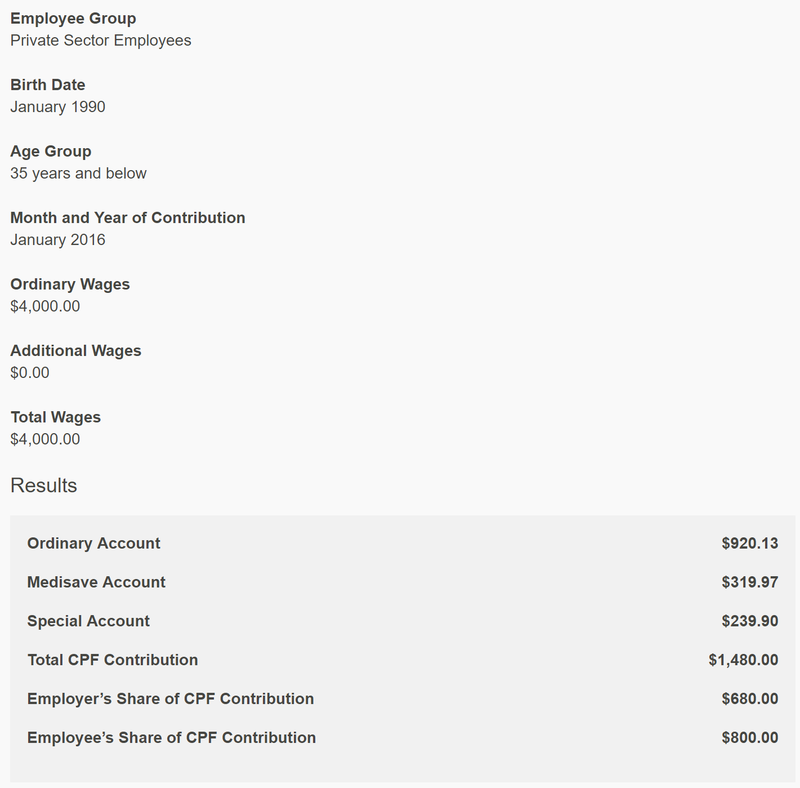 By the end of 2019, he and his wife would have an estimated amount $96,000 in savings and $92,742 in CPF OA each. Upon key collection, everything would be used to pay off the housing loan. Hence, the loan amount would be around $286,258. 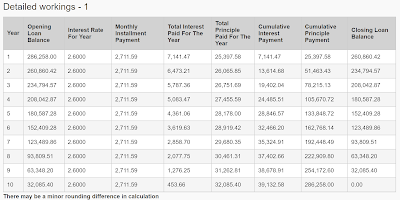 The total interest incurred is $39,132 with a monthly repayment of $2,711.59. Assuming they split the repayment equally, the monthly repayment will be $1,355.80 each ($920.13 from CPF OA and $435.67 cash). At the end, he would have $247,719.60 in savings, $201,176.74 in OA and $219,016.19 in SA, with a total asset of $667k. By the end of 2019, he would have $34,297.57 in OA. The final loan amount after the down payment would be $406,404. Total interest incurred over 25 years is a ridiculous $146,715! In comparison with my friend's plan, the amount of interest paid is 275% more! 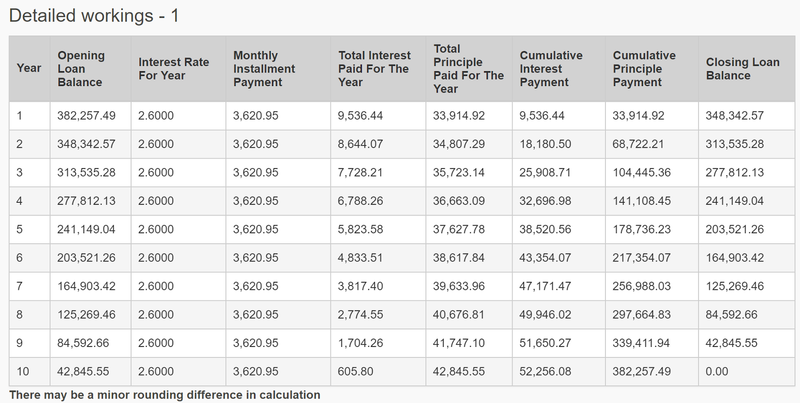 The monthly repayment is $1,843 which is about $921.5 each (let's just assume this can be fully paid by OA). At the end of 25 years, he would have $0 in savings, $0 in OA, $254,350.50 in SA and $635,595.44 in investment with a total asset of $889k. Keeping everything constant except that he starts to invest in STI ETF with those savings, instead of having $247,719.60 in savings, he would have $386,708.54 of investment and a total asset of $806k. That is a 21% difference! Do not underestimate the 4% compounded return from the investment. The calculation can be found in this google spreadsheet. Lots of assumptions have been made above to keep the calculations simple. The biggest assumptions made are your wife continues to work for the next 25 years (CZM keep saying she wants to retire and be a tai tai housewife) and the salary staying constant for 25 years (that is just so sad). Furthermore, having $0 savings is crazy too. On a side note, my friend wants to chiong his housing loan with the intention of getting a second property but not for myself and CZM. 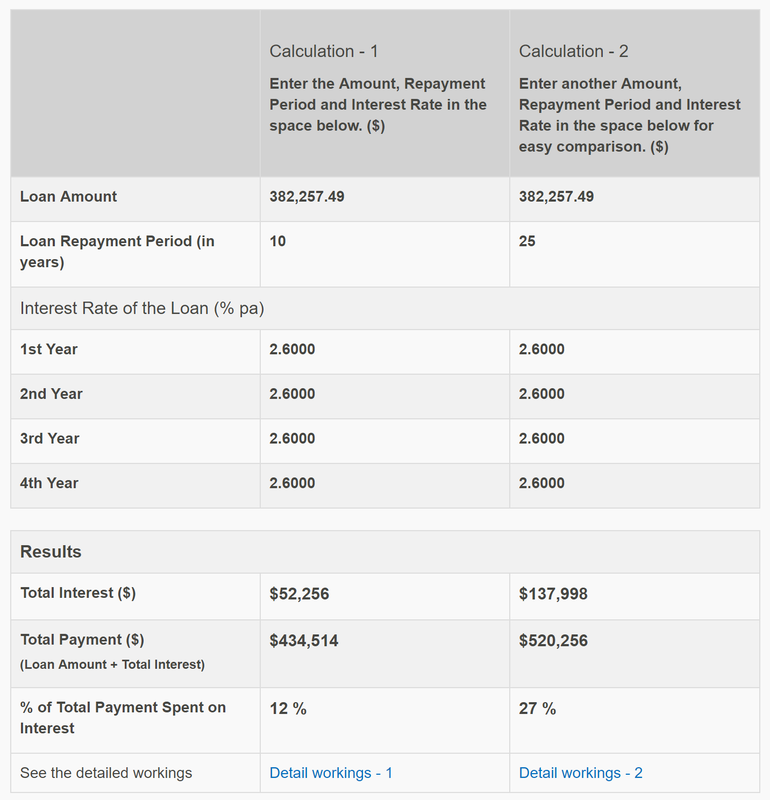 I am guessing someone might be thinking that the interest computed above is not the true cost of borrowing/paying loan using CPF OA. There is double interest when using CPF OA (2.6% housing loan interest + 2.5% CPF OA interest) and one will be paying a total of 5.1% interest. This is a huge misconception! At the end of the day, one must not forget that CPF is for retirement planning. You are only required to pay back the 2.5% OA interest if you sell your house before you are 55 years old. After 55 years old, one only has to top it up until it hits the minimum sum. My friend and I do not intend to sell our house, hence the above forecast/projection. Alternatively, one can always use cash to pay their housing loan but I believe the right investment in the long run will provide a return higher than 2.5%. There are many many other possible scenarios and there is no one or right way to do it. The important thing is to sit down with your other half (if there is one) and plan accordingly. In my opinion, housing loan is a "good" debt that one does not have to repay quickly similar to how companies leverage debts to grow. It is not necessary bad but how it is being used. - Investment Moats: Should we repay more of our 2.6% HDB loan to save 0.1%? Our portfolio grew by 9.25% this month (through both capital injection and capital gain) bringing it to $236k! Total capital injection YTD (Year Till Date) is $57,818 and capital growth of $11,349. 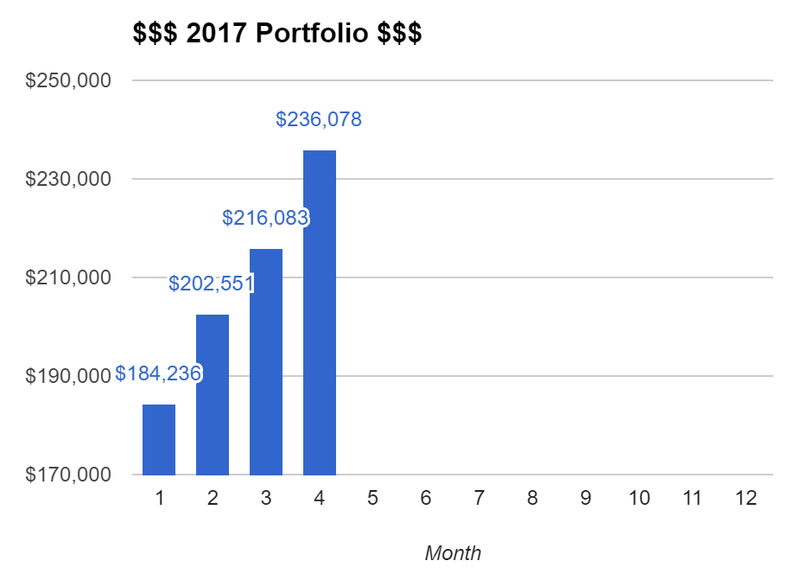 With that we have exceeded our target/goal for the year and we are on track to our 1 million portfolio in 10 years time - refer to Our Goals. For the month of April, we bought 1 stock (GuocoLand) and subscribed to Ascott REIT rights issue. GuocoLand has a NAV of $2.96 and has been paying dividends ($0.05/$0.08) over the years. This stock was brought to my attention by one of AK's blog post where he gave a detailed analysis over here - Invested in Guocoland with Mr. Quek Leng Chan. I fully subscribe to Ascott REIT 1,450 rights issue and over subscribe/allocated another 1,150 shares. Based on my last analysis on the rights issue, I was previously sitting on a loss of -$395.62 (-6.66%). However, as of the last closing price ($1.11), I am currently sitting on a gain of +325.98 (+3.91%). That is how it is, up and down, there is no need to be too affected by the volatility of the stock price.